Polyhydramnios is the presence of excess amniotic fluid in the uterus. By definition, polyhydramnios is diagnosed if the deepest vertical pool is more than 8 cm or amniotic fluid index (AFI) is more than 95th percentile for the corresponding gestational age. With a deep pocket of 8 cm as criteria of polyhydramnios, the incidence is 1-3% of all pregnancies. About 20% are associated with fetal anomalies. Polyhydramnios has a variety of causes affecting the mother or the fetus. The presence of polyhydramnios should prompt a search for other fetal anomalies. Some of the anomalies can be diagnosed with sonography, while others require karyotyping. Clinical examination can reveal a uterine size larger than that expected for the corresponding gestational age of the fetus. Ultrasonography is the most reliable method for diagnosing and quantifying polyhydramnios. Experienced operators make the diagnosis based on subjective assessment. The height of the deepest pocket and the AFI are objective semiquantitative measurements of the amniotic fluid. MRI is not necessary for the diagnosis of polyhydramnios, but polyhydramnios can be detected during MRI for other indications. Three limitations of MRI are notable. First, MRI is not cost effective. Second, it is time consuming. For example, the time required for magnetic resonance volumetry can be as long as 6 hours, which is not ideal when sonography can be performed in only a few minutes. Third, MRI requires knowledge of computers and postprocessing. CT scanning is generally avoided during pregnancy. MRI is not essential in the imaging protocol for polyhydramnios, but if it is performed for fetal or maternal imaging, it can also be used for diagnosing polyhydramnios. Although allowances must be made for a smaller fluid volume (except in polyhydramnios) and for segmentation of the amniotic fluid in vivo being slightly more difficult owing to fetal motion, volumetric measurements are likely to represent the real values. MRI is good for assessing the volume of amniotic fluid and for diagnosing polyhydramnios. However, MRI is not mandatory for the diagnosis of polyhydramnios. A good correlation was obtained between MR volumetry studies and the actual amniotic fluid volume. Although this would not be a cost effective method of diagnosing polyhydramnios, it would be of greater help in monitoring therapeutic response to polyhydramnios treatment. The common sequences used are T2-weighted single-shot fast spin-echo and high-spatial-resolution T1-weighted fast spin-echo images subsequent to a spoiled gradient-echo localizer. Measuring the amniotic fluid volume is difficult when the quantity is low because no difference in signal intensity can be noted between a thin rim of fluid and the placenta and uterine wall; this similarity makes postprocessing and automatic segmentation difficult. Although 3D reconstruction of a fetus is better with a large amount of amniotic fluid present, fetal motion adversely affects image processing and reconstruction. Use of an automatic threshold for excluding amniotic fluid excludes other tissues containing the same signal intensity, such as fetal brain and fluid-filled fetal organs (eg, the urinary bladder). With the AFI method, the uterus is divided into 4 quadrants. The depths of the deepest vertical pool in the 4 quadrants are measured and added to give the index. Occasionally, at less than 20 weeks, only the right and left lower quadrants are used. The normal index is 5-24. In polyhydramnios, it is more than 24. AFI of a normal population (ie, normative values) corresponding to the gestational age can be noted, and the percentile value of the particular patient can be calculated by using the mean and standard deviation. 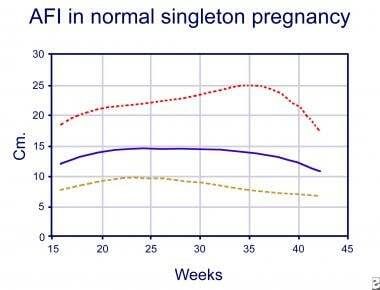 The graph below shows the normal limits of AFI based on gestational age. The mean AFI for normal pregnancies is 11-16 cm. Polyhydramnios is diagnosed when the AFI is more than the 95th percentile value. Normative values are not available before 16 weeks of gestation. Graph illustrating amniotic fluid index in a normal singleton pregnancy. The solid line is the mean AFI, the lower dotted line is the 5th percentile value, and the upper dotted line is the 95th percentile value (data adapted from Moore, 1990). Image courtesy of Christopher L. Sistrom, MD. The incidence of polyhydramnios can vary with the technique used. A single deep pocket more than 8 cm is diagnostic of polyhydramnios. With the single-pocket technique, the incidence is 0.7% (1.1% for oligohydramnios). With the 2-diameter pocket, the rate is 3% (30% for oligohydramnios), and with the AFI method, the rate is 0% (8% for oligohydramnios). Therefore, the single-deep-pocket method is the best technique because it classifies the least number of cases as being abnormal. A simple rule of thumb is that in the first trimester, the fluid is more than the embryo/fetus; in the second trimester, the fluid is equal to the fetus; and in the third trimester, the fluid is less than the fetus. Twins can be monochorionic or dichorionic. The difference can be assessed by careful observation. In dichorionic twins, the intermembrane septum is thick, with 3 or 4 membrane layers, and the membrane is more than 2 mm. The triangular sign is present and very specific. In dichorionic twins, the cause of polyhydramnios is the same as that in a singleton pregnancy. Sonography may be useful in screening for growth retardation. Ultrasonography may be helpful in evaluating the mouth, stomach, small bowel, and abdominal wall. The AFI should be monitored twice a week when the patient is being treated with indomethacin. The treatment is stopped when the AFI is less than normal. The response is seen usually between 4 and 20 days. Doppler imaging of the ductus arteriosus is also done within 24 hours of starting treatment and once weekly thereafter. Indomethacin is known to cause premature closure of ductus arteriosus, and if this happens, indomethacin is stopped. The values for amniotic fluid index, single deepest pocket, and 2 diameter pockets are not normally distributed throughout pregnancy. Therefore, a logarithmic transformation is required for gestational age–specific ranges. Normative values also vary within a population. The incidence of detection of polyhydramnios varies with the technique used, as discussed in Amniotic fluid above. Sonographic assessment of amniotic fluid is a poor indicator of amniotic volume. The 95% confidence limit is wide compared with the dye-dilution technique for the measurement of amniotic fluid volume. If color Doppler imaging is used along with normal scanning, the AFI is less than that obtained without Doppler techniques. This difference increases the diagnosis of oligohydramnios. Chorioangiomas larger than 5 cm can produce complications including polyhydramnios, preeclampsia, preterm delivery, congenital malformation, congestive cardiac failure, antepartum hemorrhage, intrauterine growth retardation, and microangiopathic hemolytic anemia. Sonograms show a placental mass with anechoic spaces, which demonstrate flow on color Doppler studies and pulsatile flow on spectral Doppler trace studies. Nuclear medicine studies have no role in the evaluation of polyhydramnios. Nelson DB, Dashe JS, McIntire DD, Twickler DM. Fetal skeletal dysplasias: sonographic indices associated with adverse outcomes. J Ultrasound Med. 2014 Jun. 33 (6):1085-90. [Medline]. Santana EF, Oliveira Serni PN, Rolo LC, Araujo Júnior E. Prenatal Diagnosis of Arthrogryposis as a Phenotype of Pena-Shokeir Syndrome using Two- and Three-dimensional Ultrasonography. J Clin Imaging Sci. 2014. 4:20. [Medline]. Kubik-Huch RA, Wildermuth S, Cettuzzi L, et al. Fetus and uteroplacental unit: fast MR imaging with three-dimensional reconstruction and volumetry--feasibility study. Radiology. 2001 May. 219(2):567-73. [Medline]. Benzer N, Pekin AT, Yılmaz SA, Kerimoğlu ÖS, Doğan NU, Çelik Ç. Predictive value of second and third trimester fetal renal artery Doppler indices in idiopathic oligohydramnios and polyhydramnios in low-risk pregnancies: a longitudinal study. J Obstet Gynaecol Res. 2015 Apr. 41 (4):523-8. [Medline]. Alfirevic Z, Luckas M, Walkinshaw SA, et al. A randomised comparison between amniotic fluid index and maximum pool depth in the monitoring of post-term pregnancy. Br J Obstet Gynaecol. 1997 Feb. 104(2):207-11. [Medline]. Magann EF, Sanderson M, Martin JN, Chauhan S. The amniotic fluid index, single deepest pocket, and two-diameter pocket in normal human pregnancy. Am J Obstet Gynecol. 2000 Jun. 182(6):1581-8. [Medline]. Magann EF, Doherty DA, Chauhan SP, et al. How well do the amniotic fluid index and single deepest pocket indices (below the 3rd and 5th and above the 95th and 97th percentiles) predict oligohydramnios and hydramnios?. Am J Obstet Gynecol. 2004 Jan. 190(1):164-9. Moore TR, Cayle JE. The amniotic fluid index in normal human pregnancy. Am J Obstet Gynecol. 1990 May. 162(5):1168-73. [Medline]. Hebbar S, Rai L, Adiga P, Guruvare S. Reference ranges of amniotic fluid index in late third trimester of pregnancy: what should the optimal interval between two ultrasound examinations be?. J Pregnancy. 2015. 2015:319204. [Medline]. Kirshon B. Fetal urine output in hydramnios. Obstet Gynecol. 1989 Feb. 73(2):240-2. [Medline]. Engineer N, O'Donoghue K, Wimalasundera RC, Fisk NM. The effect of polyhydramnios on cervical length in twins: a controlled intervention study in complicated monochorionic pregnancies. PLoS ONE. 2008. 3(12):e3834. [Medline].